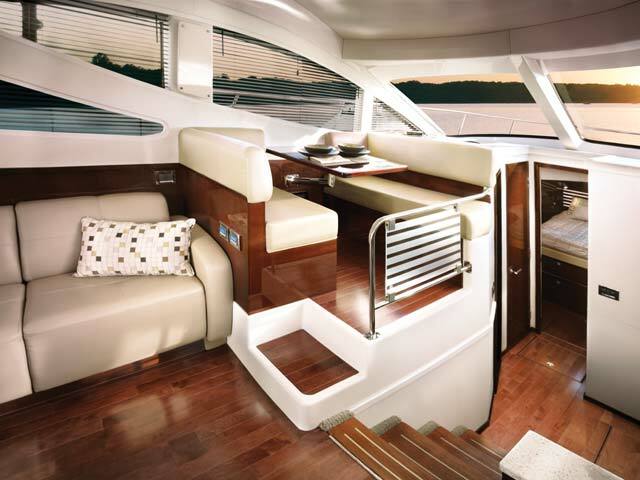 Introducing the all-new Sea Ray 450 Sedan Bridge, the latest addition to Sea Ray‘s best-selling lineup of sport yachts. 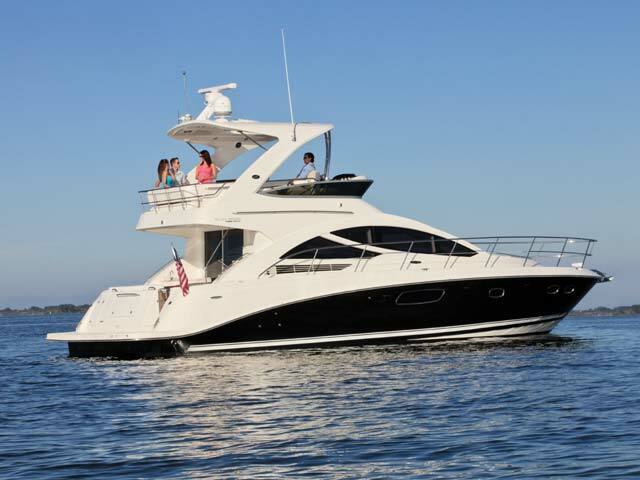 Style surrounds the 450 Sedan from its seamless fiberglass spoiler and Sunbrella® soft top, to its graphic striping at the water line, this impressive sports cruiser is sure to command attention. The helm is stylish and well designed, starting with ergonomically placed switches and controls and a commanding helm chair for unrestricted visibility. 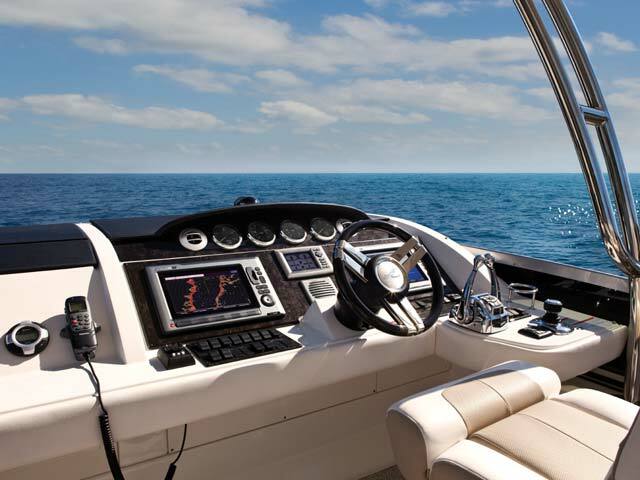 For the ultimate in situational awareness, the 450 comes standard with SmartCraft® instrumentation and a entire suite of optional Raymarine electronics including but not limited to dual Raymarine® E120W widescreens with Hybrid Touch, 4-kW High Definition (HD) open array radar, Sirius® Weather and DSM 300 depth sounder. Add standard joystick-control and autopilot for the twin 480-hp Cummins MerCruiser® diesel engines with Zeus® pod drives and you have the perfect control at your finger tips at all times. The intuitive Zeus system allows precision docking for helmsmen of all skill levels while also improving cruising performance and fuel efficiency. Zeus even comes standard with Skyhook®, a station-keeping function that maintains vessel position at the push of a button, despite the presence of wind and current. Natural light and earthy tones create a bright, relaxed atmosphere in the salon. 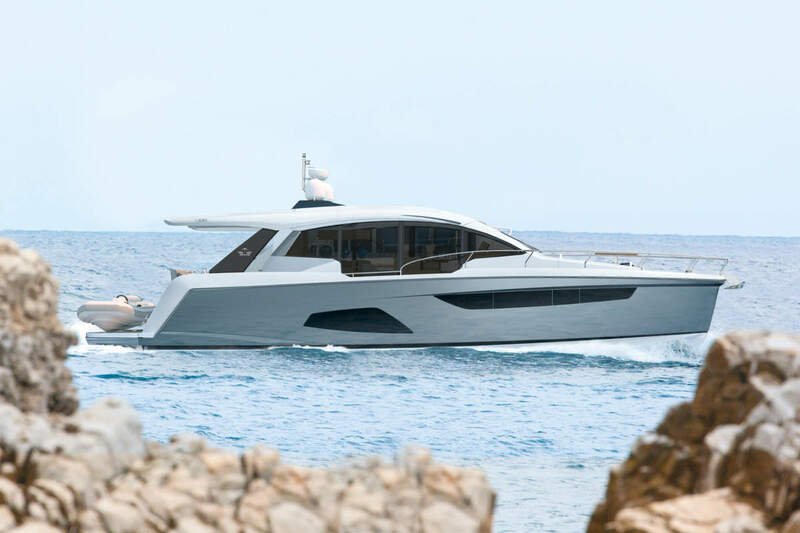 This area has large curved hull windows, incredible head room, moveable wing chairs and a 36,000-BTU, zone-controlled air-conditioning system with reverse-cycle heat. The supple Ultraleather™ sofa faces a stylish coffee table and an entertainment center with 32” Sony® LCD HDTV, remote DVD player and Sony® sound system. The refined ambiance of the 450’s salon can be further elevated with the addition of optional wood flooring. Forward, the raised dinette offers great views and comes with a high-gloss table and wood accent flooring. Just a few steps down from the salon and dinette, the galley features an upright refrigerator/ freezer, microwave/convection oven, recessed two-burner stove, pull out pantry, and abundant storage in cabinetry crafted at our state-of-the-art, multimillion-dollar woodworking facility. Whether they are staying in the forward master or the amidships guest stateroom, the 450 surrounds passengers in comfort. 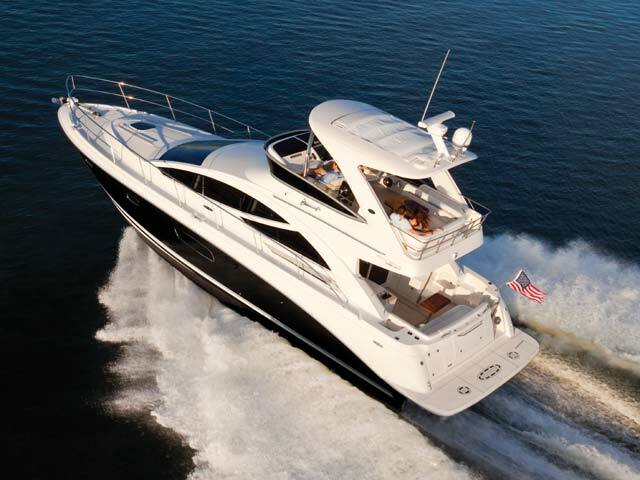 Appointments in the master include a queen berth with a pillow top innerspring mattress, two large cedar-lined hanging lockers, a 22” LCD TV with DVD player, and loads of light from four portholes, a skylight and fixtures. A private, en suite head has another skylight as well as an enclosed shower stall, standard VacuFlush® system, and vanity. 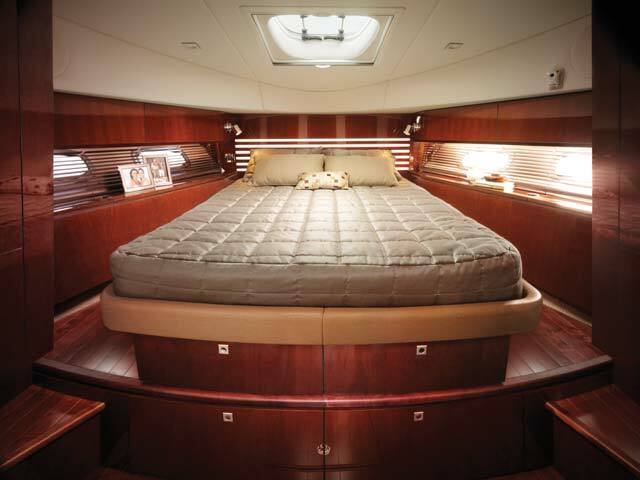 The aforementioned guest stateroom features twin berths that convert to a king, plus a nightstand, cedar-lined hanging locker, large hull window and skylight, and more storage under the beds. Another head with the same outstanding features as that of the master attends the guest stateroom and also serves as the day head. 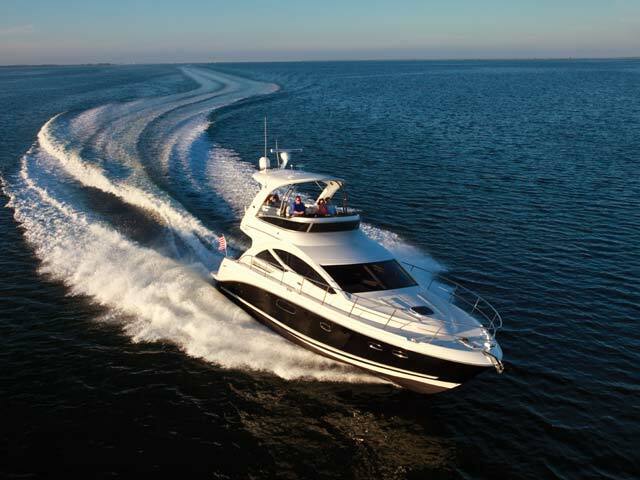 Optional perks like a lower helm station, washer/dryer, central vacuum, Bose® LS48 sound system, DSS satellite TV system, underwater lights, network interface cameras in the engine room and cockpit, and a thermal imaging camera for nighttime cruising raise the bar even higher. 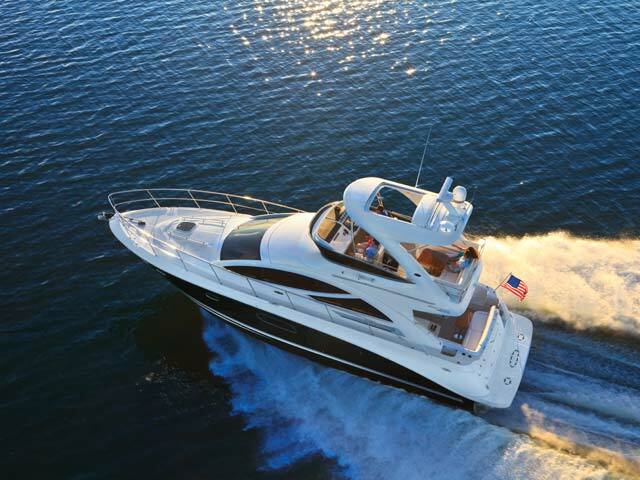 In short, with unrivaled views inside and out, brilliant use of space and impressive appointments, make the new Sea Ray 450 Sedan the perfect Sports Cruiser to enjoy the freedom and relaxation of cruising.